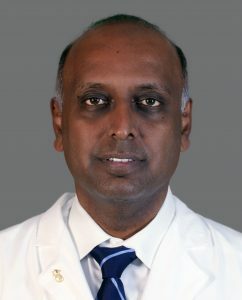 MIAMI, FL — September 4, 2018 — Renowned interventional radiologist Govindarajan Narayanan, M.D., has joined the clinical teams at two of Baptist Health South Florida’s premiere service lines – Miami Cardiac and Vascular Institute, the area’s largest and most comprehensive cardiovascular facility, and Miami Cancer Institute, a next-generation cancer center and Florida’s only member of the Memorial Sloan Kettering (MSK) Cancer Alliance, where he has been named Chief of Interventional Oncology. Dr. Narayanan brings a wealth of academic, clinical and research expertise. He comes to Baptist Health from the University of Miami Leonard M. Miller School of Medicine, where he was the founding chair of the Department of Interventional Radiology and held the titles of Professor of Interventional Radiology and Professor of Urology. A member of numerous professional and honorary organizations, he is also a pioneer in his field, developing the technique of percutaneous irreversible electroporation (IRE) of the pancreas. In his new role, Dr. Narayanan will lead Miami Cancer Institute’s division of Interventional Oncology, which has become an essential component of its comprehensive, multidisciplinary model of oncologic care. Dr. Narayanan’s discipline includes residency training in nuclear medicine at Methodist Hospital of Brooklyn and Memorial Sloan Kettering Cancer Center in New York, as well as a residency in diagnostic radiology at St. Barnabas Medical Center in Livingston, New Jersey. His fellowship years encompassed training in interventional radiology at the Medical University of South Carolina in Charleston and Stony Brook University Hospital in New York. Dr. Narayanan is board-certified in diagnostic radiology and holds a Certificate of Added Qualification in interventional radiology. Dr. Narayanan’s primary clinical research interests include pancreatic, liver and colon cancer. He is widely published in such prestigious medical journals as Cancer, Journal of Vascular and Interventional Oncology and Cardiovascular & Interventional Radiology and serves as a reviewer and editor for several scientific publications. His published work on Percutaneous IRE of the pancreas was honored as a distinguished study of the year at the 2018 Society of Interventional Radiology Annual meeting. He also is an invited faculty member and speaker at several national and international scientific meetings. Highly skilled interventional radiologists such as Dr. Narayanan are uniquely qualified to diagnose cancer and to treat the disease utilizing targeted, minimally invasive procedures performed under image guidance. The scope of interventional oncologic interventions includes tumor ablation, chemoembolization and radioembolization. These advanced interventions also can be used to manage pain and alleviate a variety of other cancer associated symptoms. Because incisions are small and the procedures are quick and precise, side effects and recovery time are minimal. Miami Cancer Institute is part of Baptist Health South Florida, the largest healthcare organization in the region, with 10 hospitals (Baptist Hospital, Baptist Children’s Hospital, Bethesda Hospital East, Bethesda Hospital West, Doctors Hospital, Fishermen’s Community Hospital, Homestead Hospital, Mariners Hospital, South Miami Hospital and West Kendall Baptist Hospital), more than 40 physician practices, 50 outpatient and urgent care facilities, Baptist Health Medical Group, Baptist Health Quality Network and internationally renowned centers of excellence spanning across Monroe, Miami-Dade, Broward and Palm Beach counties. A not-for-profit organization supported by philanthropy and committed to our faith-based charitable mission of medical excellence, Baptist Health has more than 19,500 employees and more than 3,000 affiliated physicians. Baptist Health South Florida has been recognized by Fortune as one of the 100 Best Companies to Work For in America and by Ethisphere as one of the World’s Most Ethical Companies. For more information, visit BaptistHealth.net/newsroom and connect with us on Facebook at facebook.com/BaptistHealthSF and on Twitter and Instagram @BaptistHealthSF.